Our mission is to create and maintain lawns and landscapes which will provide our customers with a lifetime of gratification and value, as well as establishing a trusting relationship with our clients throughout the coming months and years. We value team work, responsiveness, consistency, and exceeding expectations. Our vision is to be a well-respected landscaping company in the Cincinnati area. We partner with our clients from imagination through execution to create meaningful, enduring landscapes and continue to be a problem solver for all their outdoor solutions. We are not a Cincinnati lawn mowing company that will come out and cut your lawn when the grass hasn’t grown or it is too wet to mow. You don’t want that, and neither do we. We have someone to answer your calls 5 days a week between 7:30am – 5:00pm. This makes it nice for our customers who have specific needs for that day or week. Lawn maintenance in Cincinnati usually starts in the first few weeks of April, and it usually continues until the end of November, sometimes even into December. We take a lot of pride in our customer’s yards. We will never leave your location until all work is completed the proper way. You will also find that our pricing is extremely competitive. Please contact us to come and talk to you about your lawn mowing and maintenance needs and offer you a free estimate, which we can typically get back to you within 24 hours. Fertilizing your lawn properly makes a huge difference on the richness, color, and life of your lawn. ￼Our lawn fertilizing program includes 5 steps that begin in March and end in late November. Our program gives your lawn the right amount of Nitrogen at the right times to keep it as green as possible all year round, and our carefully timed, pre and post emergent weed controls will keep your yard weed-free. We take our time on each application to be sure to get good coverage and notice and correct any problem areas in your lawn. Grub control is available if needed, and fertilizers, insect, and disease treatments are available for all the shrubs and trees in your landscape. Hire us to mow your lawn, and we can time the application of fertilizers to work most effectively with your mowing schedule. We have the experts on staff who have the proper licensing and credentials to create a custom program for you lawn that will envy your neighbors! We also offer affordable organic options! Please contact us for a free estimate or just a second opinion about lawn fertilizing or any other landscaping service needs. If you are going to spend money on a quality landscape, doesn’t it make sense to keep it weed-free, well-kept, and healthy? Our landscape technicians will visit your landscape on a regular basis to pull and spray weeds in the flowerbeds, prune as needed, with an emphasis on hand pruning. They will also report any problem areas that they notice. Our knowledgeable crew members have the expertise and equipment to do the job right and efficiently! This service is inexpensive and is one of the best investments you can make in your landscape by maximizing its beauty and health. 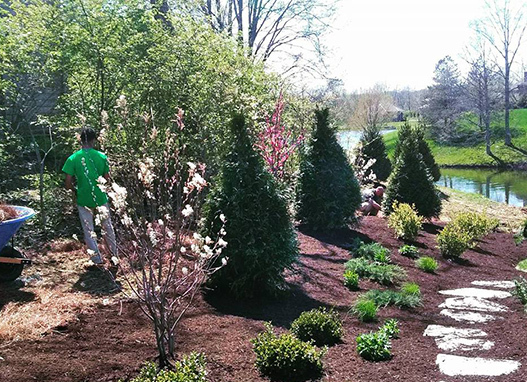 We also offer regular bed maintenance, which includes pulling and spraying weeds in your beds, pruning trees and shrubs as needed, and we’ll also rejuvenate your mulch. This keeps the mulch fluffy and helps it keep its color too. Please contact us for a free estimate on this very important landscaping service! Creative Scapes should be on your schedule for fall! Fall Maintenance is an important step in taking care of your Cincinnati landscaping. Winter is on its way, and it’s important to care for your plants the right way so that they will be ready for the next coming spring. Fall is a great time to prune your trees and shrubs, rake plant material and leaves out of your flower beds and lawn area, and also add some color to your flower beds with some hardy fall mums. Creative Scapes can clean them out of your flowerbeds, gutters, and yard and haul them away. Please contact us for more information about Creative Scapes Fall Landscape Maintenance services. Want to see what your house looks “lit up?” Call today to have one of our lighting experts come to set up a demo set at no charge. Whether you want to install just a few pathway lights or completely light up your entire landscape, we are here to help! With outdoor lighting, you can enjoy your landscape at all hours of the day. Outdoor lighting also adds security and gives you that peace of mind feeling! Contact us today to find more about our lifetime warranty lighting systems! Ever wish someone else would shovel and salt the sidewalks, plow the parking lot, and prevent accidental slips so you didn’t have to worry about the whole mess? Creative Scapes can do it for you, on time, every time. We offer a full-service, Cincinnati residential and commercial snow removal service complete with snow shoveling of walkways, patios, and decks. De-Icing is always available. Every one of our truck drivers are experienced and will treat your property with the respect and attention it deserves. We are always ready, 24 hours a day, seven days a week. Don’t wait for a big storm to figure out what to do with a parking lot packed with snow – contact us and schedule this service now. You’ll be thankful you did (and you’ll probably feel pretty smart too). In effort to provide our customers with the best possible plant health care services, we are excited to have a strategic partnership with Bartlett Tree Experts. A company that was founded in 1907 by Frances A. Bartlett, BTS is the foremost expert on the care of trees in the United States. As a valued client of Creative Scapes, a Bartlett Professional can visit your home to inspect your trees for health and safety issues. We will then forward their recommendations as well as their fair pricing as we get them. We can use an integrated approach to managing insects and diseases that begins with maintaining plant health using sound cultural practices, including pruning and creating optimal soil conditions for plant growth. Periodic inspections are essential to detect pest infestations before they reach damaging levels. Our partnered arborists are trained to recognize beneficial insects that will help naturally suppress pest populations, and we also release beneficials to augment existing populations. We also offer Organic Options! Healthy plants begin with healthy soils. Fertilization is just the start. Adjusting soil pH and ensuring adequate organic matter is present are also key to healthy soils. For plants in urban and suburban soils, our partnered experts can simulate the optimal conditions for growth found in nature. Our partners offer the most intensive soil care programs in the landscape industry. Before fertilization is performed, soil samples are taken from the property and analyzed. Whether it be pruning at 60 year old oak tree or a smaller, multi-stem ornamental tree, we can prune it the correct way! Our goal is, and has always been, to provide services that keep lawns and landscapes healthy — and that does include trees. But there are instances when removal is the best alternative for the landscape and homeowner and when that time comes, we are here to help! Our partnered arborists are highly trained to work safely and efficiently in all tree removals. We provide thorough clean up of debris and strive to minimize the impact to surrounding vegetation. Serving customers within our service radius of Cincinnati, including Anderson Township, Pierce Township, Amelia, Batavia, Newtown, Eastgate, Mt. Washington and all surrounding communities. If you are in the market of first class landscaping service, contact us today – we are able to come out and give you a free estimate the same day, or the next in most cases.